2 out of 3 Filipino fighters wins the fight in the ONE Championship: Clash of Heroes. Both team Lakay's fighters win the fight and Kelly lose in the Main Event against EV Ting. Geje Eustaquio who definitely needs a comeback score a 1st round KO against the home crowd favorites Saiful Merican of Malaysia. 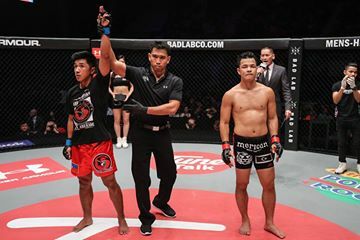 Eustaquio connects a left hook that puts down the Malaysian fighter and follows up with the soccer kick. Eustaquio comes back with an emphatic KO. Eduard Folayang wins via Unanimous Decision against Tetsuya Yamada of Japan. Folayang wins almost all rounds and scores via striking his opponent. Folayang stops the Japanese fighter winning steak and finally have his comeback after being knocked out cold by Timofey Nastyukhin last 2014. Folayang improved his record with 15W-5L while the Japanese fighter loses his first ONE Championship fight and dropped his record with 15W-4L-2D. Meanwhile in the Main Event, Eric "The Natural" Kelly was defeated by the fans favorite EV Ting. He was nailed in the first round and the 2nd round after being submitted via Guillotine Choke in the 3rd round. Ting was very aggressive in the fight and scores more damages in the first round. Kelly had a chance to submit Ting in the 2nd round but Ting was very unpredictable and escaped. Ting put himself again for a possible world title fight against Marat Gafurov who defeated him last year.